During Andy Sherman's two-year Peace Corps service in Thioke Thian, Senegal, 9-year-old Salimatou helped him navigate village life and learn the language, telling him words in Pulaar as he'd point at objects. But after returning from a stint working in another village, Sherman learned the girl had died of malaria. And after completing his service in 2002, he learned two women who had been like mothers to him also died of the mosquito-borne disease. Their deaths, and the deaths of more than 1 million people each year from malaria, prompted Sherman and fellow Saint Louis University medical student Jesse Matthews to start NetLife, a nonprofit organization that distributes mosquito nets in Africa. It's motto: Saving lives one net at a time. The two last went to Africa in 2005 to distribute 600 nets, and plan to return again this summer for 10 weeks to deliver 1,000 more. Before dropping off the nets, they scout out a village, talk to the chief and make a list of women in the community. Then, they return later with the nets, involve villagers in a skit explaining the specifics on how to use them and keep them from getting damaged. They then distribute them to the women, who make sure their families are protected by the net when they sleep. "Previously when we bought them, they were $8.50 a net. That's way more than a typical villager in Senegal could afford," said Sherman, 29. The group, which now buys nets for $5 each, distributes them for free in remote villages where people don't have them. Read more. Visit their web site and read how you can contribute to Netlife. We wanted to take something to these women Adia likes so much, and we decided to collect money for the nets," Marlene said. "These people are living in mud huts and often can't afford the $6 for a mosquito net for their babies to sleep under." To pay for the nets, the McPhersons reached out to the community. What they found astounded them. They sent e-mail appeals, stuffed school mailboxes with fliers and asked churches for help. "I thought we're not going to have enough money for everyone to get a net," she said. "I figured we could raise about $200 -- and we ended up with $2,400, enough for five nets for each woman." The sum means that all the members of the households in Nambogo and, in some cases, members of their extended families, will be protected from malaria-carrying mosquitoes. Read more. It all started with a headache, one of those pounding headaches where everything gets dizzy and makes you want to scream for bloody murder when you move your head the slightest inch. But just a headache I kept telling myself, it will go away soon. I swallowed a couple of aspirin and continued my day... one day turned into several days where I found myself waking up in incredible pain and falling asleep at night in pain. I realized there was something seriously wrong when I performed my usual morning routine, neck cracking--a little head turning to the left..pop pop pop.. followed by the other side..pop pop pop... When there was no pop pop pop, and extremely stiff pain, I began to think.... Have I maybe pop pop popped too much?!?! Only about 20 minutes after I started shivering, I started unlayering myself and realized I was sweating profusely. My fever had broke and had I not been sick, I would have felt like a Greek Goddess being fanned as I employed all of my friends to fan cold air on me. You go from one extreme to the next.. At this point, I was ready to write my will, not that I have much to leave behind because I live in Africa, and have no assets, the thought still crossed my mind. I thought I was on my deathbed, and while I am a pro at being sick, I have never felt like this. The hot/cold spells persisted all night (I didn't sleep not even for a minute). My neighbors wanted to bring me to the hospital, but I adamantely refused because I didn't want to be admitted for several days and preferred to wait it out till a morning clinic oppened and I could start self medicating. The second day was a different story. Now, for those who may not remember, during my Peace Corps training I was known throughout my group as the Diarrhea Queen. I had ecoli, giardia, every bacteria or parasite digestive problem known to man, but none of these ailments could even come clsoe to describing the Malaria Diarrhea! The malaria parasite attacks the white blood cells, and the body can literaly feel the medicine trying to fight off the parasite, and once the treatment starts working the parasite is forced to leave the body, and there are only two ways and you don't get your choice!!! I'll spare everyone the details, but let's just say I spent the second day within two feet of a toilet at all times. Not to mention incredible stomach pain with all of these incredible bowel movements! And then I thought it was over.. but NOOOOOOOOOOO.... That same night I was, again, up all night with hot/cold spells, joint pain, and another extreme headache. I was sleeping at a good friends house, who happens to be a nurse as well, and when I had to wake up her in the morning that third day from pain again she decided that we were going to the clinic in the morning because I should not have still had symptoms. That following morning at the clinic we did a malaria blood test, which came out negative but was put on about 4 different medications, my tempature translated to 103 F, which frightened me quite a bit but is now normal now. Well, I am alive.. I have survived malaria, and now wouldn't we all agree--I have an exciting story to tell!!! I can't imagine if I had been living in the village with malaria and am grateful I live in town this time aroound with access to EVERYTHING! Imagine.. you are a baby, or an elderly person suffering from these exact symptoms and are unable to tell anyone what is happening to your body. What happens then.. well, to be blunt.. you die. Malaria can be prevented by sleeping under a mosquito net, but it is still very easy to get. Yes, it is easily treatable, but what if you don't have it. You are living in a remote village with no clinic nearby. My mom recently sent me a magazine article from I believe Sports Illustrated where a man was trying to convince Americans to donate money to buy mosquito nets for Africans. Come on Americans.. it will cost you maybe the equivalent of $3 dollars and you could be saving a family's life! A big KUDOS to my mom who donated money in my honor to this worthy cause and I couldn't stress enough to all of you to think about how much I suffered during this past week, and how thousands, hundreds of thousands of innocent children die just from being bitten from a single mosquito. Okay, i'll stop preaching now, but i'm only asking all of you to stop and THINK for a moment! Read more. 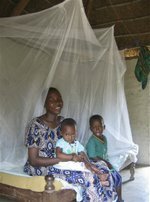 Read more about the Peace Corps and Malaria.